No one will argue the benefits of using buses for short rides, but lately they, thanks to highly improved on-board amenities, became a real inexpensive alternative also to medium distance trains. And taking into account the fact, that some routes buses cover not slower (or not much slower) than trains, it's no wonder, that so many people, especially Europeans, prefer to use precisely them. Search engines, likewise significantly refined in recent years, are able to determine optimal routes and will allow you to find and book international and long-distance bus tickets cheaply both in Europe and in the United States. First of all, about the differences of traveling by buses in Europe and North America. Unlike Americans Europeans use there public transport a lot and not without a reason: usually you can get by it at your convenience to any place there. But (as always) rules have their exceptions: for example in Norway you must not rely on the local public transport too much (one bus a day plus possibilities of delays due to weather conditions). In such cases it's much more reasonable to rent a car (especially when your car rental costs for a week equal your taxi fare in one direction); in either case don't make your schedule too tight! By the way, do you know what is the difference between coaches and buses for Europeans (we must thank England for this of course)? Coaches are the same buses only used on longer routes. As the result they don't stop very often (usually only at a central bus station which can of course be located not particularly centrally), are faster and have on-board amenities. For the time being the most convenient and widest network for international coach journeys in Europe is provided by Eurolines. To be precise it's not one company, but an association of many national level companies, well coordinated and with a joint ticket system. They all link together over 500 cities Europe-wide with travel time on some of their routes longer, than 36 hours. A journey from Berlin to Prague with Eurolines will take you 4 and a half hours, exactly so much as by train, but it's not so for all the routes (Paris to Amsterdam: 8 hours vs ~4.20 by train). Besides, they offer Eurolines Pass, the fare starts from €195 for 15 days. As a rule, a minimum set of expected onboard services includes Wi-Fi, power outlets, restrooms, air conditioning and reclinable seats. But you ought to be aware of some restrictions that apply to traveling by budget coaches. no meals provided, taking and consuming hot food aboard Eurolines coaches is forbidden. Link to Eurolines app on iTunes. Lately (January the 1st 2013) in Germany was revoked a law dated 1931, which gave Deutsche Bahn (German Railways) the exclusive right to provide long-distance (more than 50 km) public transportation services inside Germany. And as you could expect, from 2013 more than a dozen intercity bus operating companies sprang to life. And with the merger of two biggest German budget (with fares starting from €1 for some routes) long-distance bus operators (FlixBus and MeinFernBus) in August 2015 and the possibility of them entering international bus services market, bus traveling through European Continent may become even more attractive indeed. Today MeinFernBus / FlixBus connect over 400 destinations in 15 European countries and operate more than 80 lines. from Hamburg to Prague - €27 and 9 hours and for €19 you can get from Amsterdam to Paris in about 7 hours. in the long list of MeinFernBus / FlixBus destinations can also be found such cities as Lyon, Turin, Genoa, Milan, Rome, Zürich, Zagreb, Budapest, Vienna, Prague, Paris, Antwerp, Brussels, Rotterdam, The Hague, Amsterdam, Copenhagen: link to complete route network of MeinFernBus / FlixBus. It is very convenient to cover long distances during the night while traveling aboard international / intercity MeinFernBus / FlixBus buses. 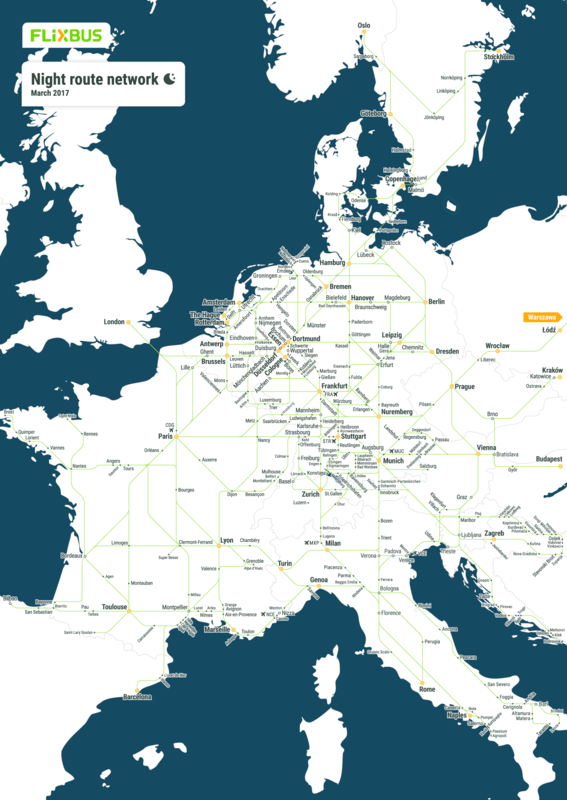 Here's the link to night international / intercity MeinFernBus / FlixBus bus route network. There can be found the following overnight bus routes: Prague - Amsterdam, Dortmund - Milan, Hamburg - Prague, Tuebingen - Berlin, Amsterdam - Paris, Cologne - Milan, Berlin - Vienna, Munich - Berlin, Utrecht - Stuttgart, Berlin - Freiburg, Copenhagen - Rostock, Munich - Vienna. Tickets of MeinFernBus / FlixBus can be bought on websites of the both carriers, the prices are the same. the fare of €19 for the aforementioned Amsterdam-Paris trip on Friday will rise up to €25 and to € 39.50 on Sunday (departure at 14:40)! The same thing happens during holiday periods. Direct routes are always cheaper (half the price or even less) than ones requiring any kind of transfer. Tickets can be booked online via Direct debit or credit card (Visa or MasterCard), PayPal, SofortÜberweisung and iDeal and also bought from the bus driver (he will sell you tickets at regular price, savings and promotional fares are available only online). You can change/rebook/cancel your MeinFernBus / FlixBus booking up to 15 minutes before your departure. The full cancellation of the booked trip will cost you €15, but instead you can choose to take a voucher equal to the price of your original booking, which can be used within 12 months. You'll also receive a voucher if you want to change your trip's date/time or destination. for carrying bulky baggage or your bicycle you'll have to pay additional €9. Each of MeinFernBus / FlixBus buses is equipped with air conditioning, has an onboard toilet, reading lamps, comfortable seats, free Wi-Fi (operating in test mode, so there can be dead zones during your journey or not all of the passengers will be able to use it at the same time); there're electrical sockets as well as Media Center with films and music on demand in many buses. On board you'll be offered snacks and drinks (you can buy from your bus driver water 500ml for €1, Coca Cola for €2, Snickers / Twix / Mars will cost you €1). Small children between 0 and 3 years of age can only be transported in child car seats (not available in the bus and can not be booked in advance). Children under age 15 travel at a discount rate (depends on the route). Children younger than 10 years must be accompanied during their trip by a person who is at least 18 years old. Carriage of any pets or animals (with the exception of registered sensing dogs for the blind) and smoking aboard MeinFernBus / FlixBus coaches is strictly forbidden. Link to homepage of MeinFernBus / FlixBus, FlixBus itune US app. Look there for special deals and offers, or you'll be able to find some of them on our page for special deals, offers and promo codes. By the way, now you can also book a whole FlixBus (with driver)! Every IC Bus is equipped with free WiFi, comfortable seats with adjustable backrests, power outlets at every double seat, air-conditioning, on-board toilet. Snacks and drinks are available for purchase aboard every IC Bus. Baggage is limited to two pieces per passenger and may not exceed the dimensions 70x50x30 cm (150 cm), it can not be transported in the seating area. Animals (with the exception of certified service dogs) are prohibited to board an IC Bus. Children up to 6 years and children accompanied by their parent / grandparent up to 14 years travel free of charge, 50%-discount for children of 6-14 years traveling alone. For €6 on domestic and for €10 on international routes you can take your bike with you (DBahn recommends to book it at least 1 day before departure). For your IC Bus ticket you can pay by credit card, PayPal, SOFORT or SEPA direct debit. In addition to the three already mentioned, another German bus carrier, Postbus (now also belongs to FlixBus/MeinFernBus family) enjoyed extreme popularity among the passengers (it was jointly owned by Deutsche Post and ADAC — German Mail and German Automobile Club). The buses and onboard services of this carrier were a bit better and the fare was a bit higher also. Postbus is no more!!! Now it belongs to the group of MeinFernBus / FlixBus. Pity :( Liked its "Werbung" (ads), such cute buses. From Germany Postbus could get you to many cities in other European countries (Vienna, Antwerp, Brussels, Milan, Turin, Budapest, Copenhagen, Paris, Amsterdam, The Hague, Zürich, Barcelona and so on). For booking Postbus tickets online you could use MasterCard, Visa, American Express, giropay, SOFORT Überweisung, Online Überweisung (Deutsche Telekom), PayPal and on board — MasterCard, Visa, American Express, Maestro, girocard (EC-Cash), V Pay and cash. In every (very modern one) Postbus you could plenty of legroom, adjustable reclining seats, restroom, climate control, WiFi connection, power outlets (230v) for each seating row and media center (but in order to use it you'll need a personal smartphone or tablet). In every Postbus you could buy snacks and beverages (even containing alcohol) for a very reasonable price (coffee or hot chocolate will cost you €1, beer Beck's pilsner 0,33 l - €2). BoltBus is in reality Greyhound’s budget, non-stop (or limited-stop) city-to-city service, covering the US’ northeast and west coast areas. Also you can choose services of PeterPan, RedCoach, Jefferson Lines, Adirondack Trailways or other providers. Traveling by train in Europe — European railroad tickets. Traveling in Europe by car — Car rentals and ridesharing in Europe.